An article which references Calit2's Larry Smarr in a discussion of the "next wave of computing." An essay by Calit2 Director Larry Smarr, which originally appeared in the New York Times, is cited on the blog North, which self-identifies as "part ad agency, part creative boutique, part crash-pad for artists, designers, film makers, bloggers, bands and big-thought thinkers." A recording of Calit2 Composer-in-residence Roger Reynolds' "Sanctuary" is mentioned in an article by arts reporter Jim Chute. Calit2 Director Larry Smarr is cited in an opinion piece about how consumer-based Internet technologies are morphing into new uses in energy conservation, transportation, health care, traffic management and food distribution. A re-posting of Larry Smarr's article about the increased programmability of our daily lives. Calit2 Director Larry Smarr gave the keynote presentation at a festival organized to celebrate the 40th anniversary of SARA. Bruce McLean Haxton talks about a Calit2 research partner: the J. Craig Venter Institute Laboratory, which has been doing cutting-edge work with genomics technology though multiple disciplines. The San Diego Beacon Community (SDBC), announced that it has selected Santech to deploy its SanText™ SMS platform to improve immunization rates through text message communication. 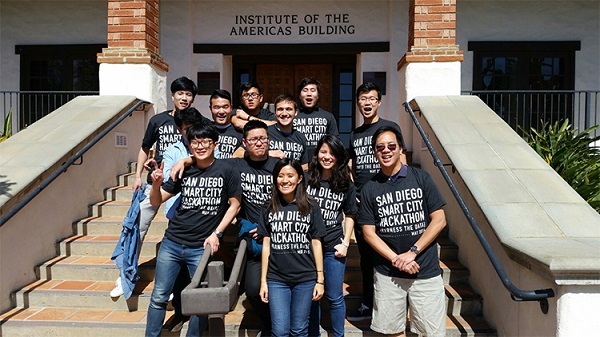 Santech was co-founded by Kevin Patrick of Calit2 at UC San Diego. The Spartanburg Herald-Journal reprints an article that originally appeared in the New York Times, with predictions from Calit2 Director Larry Smarr. The Girls Hat day project, which was led by Calit2 MyLab Founder Saura Naderi, is mentioned in the video.